It's like the bigger, badass version of the classic luggage tote, and it's out this July! 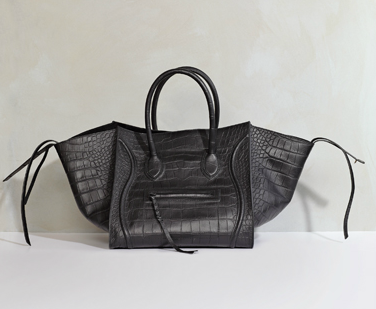 This style comes in three variations, in the stamped croc you see above, in olive suede and in a black leather & suede combo. First heard of this via Bagaholicboy who reports that the stamped croc retails for SGD3,900. The price should be thereabouts for the other variations I guess. If you can afford this, lucky! If not, well, this news is really just a menace to our frugal sensibilities. Wahaha! i love this one tin! Hi Steph! Yeah! It's a different take from Celine's minimalist start. It is intriguing!